Academics: Literacy, receptive and expressive language, conceptual understanding of mathematics and arithmetical competence. Knowledge: Science, cultural awareness, literature, music, and art. Tools for thinking: Ability to observe, recognize relationships, analyze and synthesize, interpret, draw inferences, use inductive and deductive logic, think critically, and evaluate. Self: Self-awareness, self-confidence, responsibility for one’s actions, and integrity. Others: Interpersonal skills of communication, negotiation, and cooperation, and respect for others. Community: Capacity to function within a group and a sense of social responsibility. Design: Ability to frame a problem, envision a variety of strategies and solutions, and formulate a plan and judge its probable effectiveness. Expression: Through a variety of media and with the ability to sustain effort as necessary to master skills and complete projects and plans. The following documents describe the core curriculum for each grade or blended class group. 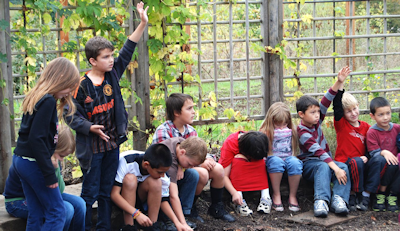 Curriculum at Springwater is carefully designed by staff to ensure that students emerge having gained all of the knowledge required by state standards, while integrating Springwater’s focus on environmental sciences and sustainability. Springwater promotes learning as an integrated, interdisciplinary process rather than as a series of isolated subjects. Basic skills will be learned in a meaningful context and become a means for understanding the world, not just ends in themselves. The core component of Springwater’s curriculum is the integration of the sciences into all core subject areas. Teaching students through science also helps them understand how they are part of a larger community, and how individuals and groups interact within and impact that community. We believe that a focus on environmental sciences is an ideal means by which to accomplish this goal, as it provides children with an opportunity to learn through active engagement. Students learn by delving more deeply into subjects with a cross-curricular approach and using environmental sciences as a unifying theme for exploration, hypothesis, and testing for “real-world” results. 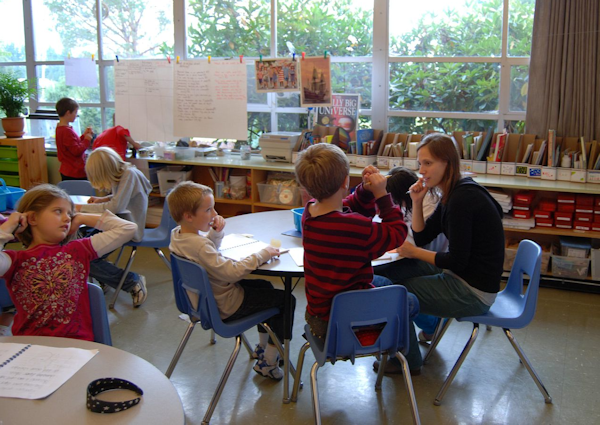 Springwater uses project-based teaching methods, which allow for instruction to be tailored to unique learning styles and needs. We focus on developing proficiency, as opposed to simply moving through a lesson plan; creating an integrated school community, as opposed to isolated classes; striving toward a depth of knowledge instead of simple rote memorization. Hands-on learning is more likely to be retained because the child is actively involved and sees some relevance of the information and skills to his/her life experience. Deeper understanding comes from learning in a variety of ways. Math skills such as measuring, adding/subtracting, and graphing are developed more quickly because there is a concrete and useful function to the skill. Language arts skills, such as explanation, demonstration, and written communication are likewise more effectively taught when students have interesting “subject matter” to communicate. Multi-sensory teaching is more effective because students, especially those having difficulty in understanding, are more likely to succeed in learning if there are a variety of ways the concept is explained, demonstrated, pictured. Cooperative and student-led learning experiences in small groups encourage students’ initiative and curiosity and teach them the social skills to work productively in a group – useful skills for all of life. 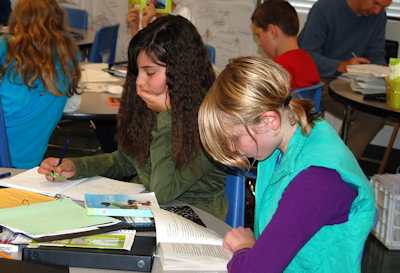 The rural school location and the Oregon City area are rich environments where students can feel the satisfaction of having improved their world in a meaningful way. Mixed-age grouping and a close-knit community of students ranging from grades K-8 will be an important feature of Springwater, reflecting our belief that combining ages creates broader opportunities for learning, and learning from each other. Springwater runs on a four-day week, with two Fridays a month reserved for on-site and off-site field study. These field studies are designed by Springwater teachers to ensure alignment with the curriculum, and are assisted by a core group of trained parent volunteers. Separate days for field study allow the children to attend in clothes that can get dirty, without having to worry about cleaning up for seat time. The 8th Grade Capstone Project is a year-long endeavor in which students embark on a journey of research, learning, and discovery about the world around them as well as a discovery of themselves and what they can accomplish. This research project allows them to use and showcase the skills they have learned throughout their years at Springwater. Students choose individual study topics, which they analyze, synthesize, and evaluate while developing the knowledge of the interconnections and interdependency of ecological, social, and economic systems. Each student demonstrates their understanding of how the health of these systems determines the sustainability of natural and human communities at local and regional levels. 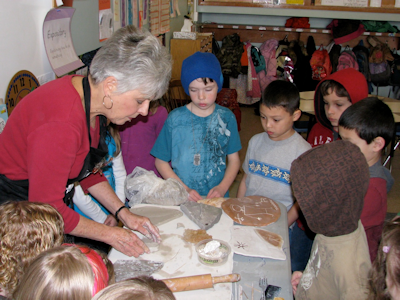 The integration of community arts in the classroom is a key component of Springwater Environmental Sciences School. Currently implemented through the artist-in-residence program, students are exposed to a wide variety of visual, musical, and performing arts. All children are encouraged to try out different media and have opportunities to explore and broaden their horizons.